There is a nice alternative to simply going out and back along the Chinle trail. It crosses through the desert and the petrified forest, drops down into a wash and loops back up on the trail. 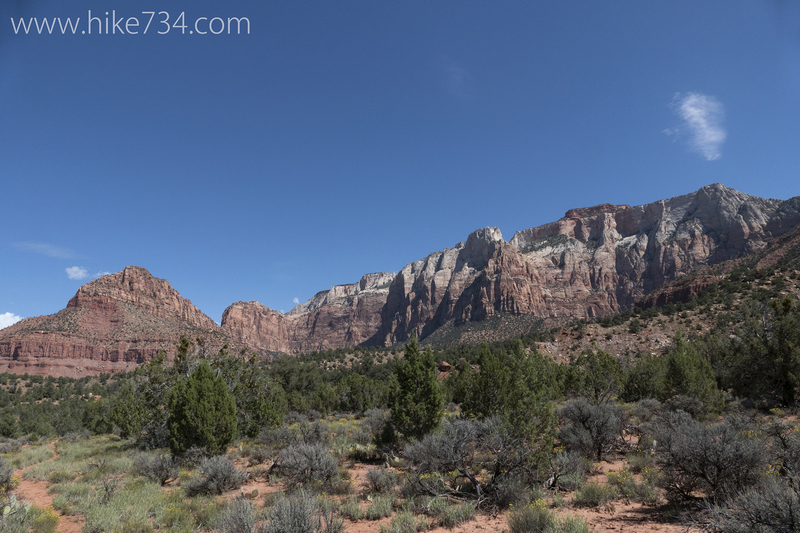 Compared to Zion Canyon, seeing people will be the exception along this trail with sparse relief from the sun. The trail continues on to Scoggins Wash where you cross at a low spot similar to Hubert Wash. You’ll alternate between the broad desert and along the rim of the wash. Keep an eye out for entertaining Antelope Squirrels that scamper across the desert with their tails in the air. The trail after crossing Scoggins Wash can be faint and difficult to follow in sections, so paying attention to subtle cues will help in finding the well-established trail further on. The junction to drop into the wash is 1.3 miles after you cross Scoggins Wash and has a sign for an old pack trail that follows a drainage down to the wash. The pack trail can be tricky to find. It is out of the drainage to the left and becomes obvious the further you go along. It steeply descends to the bottom of the wash.
Once in the wash, take a left and head back up towards the Chinle Trail. As you walk up the wash, the high walls get lower and lower until you get back to the trail where you crossed before. There are a few places where you can’t walk at the very bottom of the wash, but a quick glance at the surrounding walls (usually to the left) show social scrambles to navigate the boulders and dry waterfalls. At the junction of Scoggins Wash and the Chinle Trail, take a right back to your car. Bring plenty of water as it is nonexistent along this hike during the summer. Also, be aware of the weather conditions as the washes can flash flood with the rain.